What It’s About: In the slums of post-war Japan, a doctor, Sanada (Takashi Shimura) treats wild gangster, Matsunaga (Toshiro Mifune) for tuberculosis and the two slowly form a friendship. When Matsunaga’s boss Okada (Resiaburo Yamamoto) returns from prison and begins to give Sanada trouble, Matsunaga must choose between his gang loyalties and his friendship. Why Watch it Today? : Today is World TB Day, which commemorates the date in 1882 when Dr. Robert Koch announced his discovery of Mycobacterium tuberculosis, the bacteria that cause tuberculosis (TB). It is also a day meant to encourage working to eliminate TB. 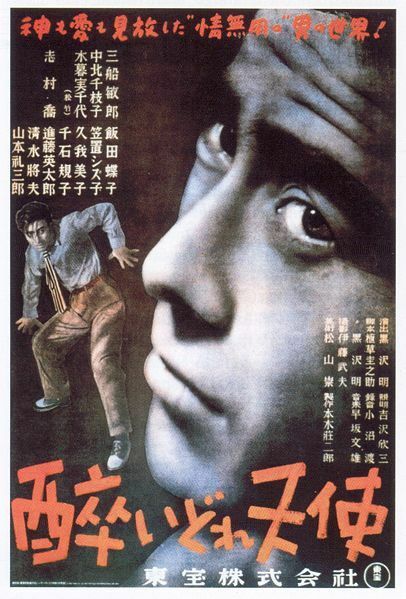 Drunken Angel is one of famed Japanese director Akira Kurosowa’s early crime films, and features the always great pairing of Shimura and Mifune. This entry was posted in Black and White, Crime, Drama, Movie of the Day and tagged Akira Kurosawa, alcoholic, clinic, doctor, Japan, slums, Takashi Shimura, Toho, Toshiro Mifune, tuberculosis, Yakuza.